Intelligence officials tasked with overseeing a massive bulk telephone data collection program misled the Foreign Intelligence Surveillance (FISA) court on multiple occasions because they did not understand how the programs worked, the nation’s top spy boss admitted in court records released on Friday. The statement was quoted in a 2009 Foreign Intelligence Surveillance (FISA) Court order published by the Office of the Director of National Intelligence on Friday, one of three court documents released pursuant to a Freedom of Information Act request by the Electronic Frontier Foundation. 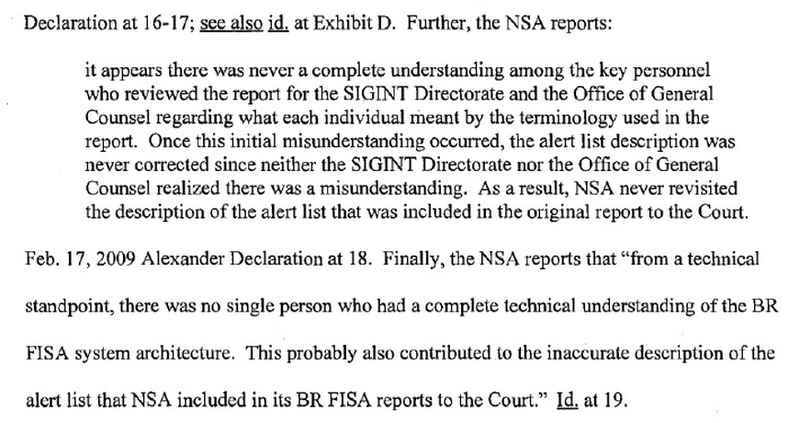 In the 2009 document, FISA Court Judge Reggie Walton wrote that intelligence officials had misled the court several times with regard to how American telephone metadata was being collected, stored and searched. Among other things, Walton found that the government had improperly distributed the personal information of Americans to agencies outside the NSA and had placed approximately 17,000 telephone numbers on an “alert list” when only around 2,000 of the numbers had met the agency’s “reasonable articulate suspicion” (RAS) level for monitoring. In another mishap, 31 NSA agents were said to have improperly search over 2,000 foreign telephone numbers within a five-day period in April 2008. Intelligence officials promised the FISA Court that it would remedy the situation by re-training the agents and installing computer software that would modify how agents accessed telephone records. Court documents reveal one NSA agent failed to install the mandated computer software, allowing him to search phone records that had not met the RAS standard. The government also told the court that two agents were able to search over 200 phone numbers within a six-week time frame that also had not met the standard. Walton found these actions contradicted how the NSA initially said it would collect, store and search telephone records when the agency submitted requests to the FISA Court for continuance of the program. Gen. Keith Alexander, the Director of the NSA, admitted that these contradictions were because key government officials tasked with submitting the requests did not have a “complete understanding” of how the programs worked. Despite not having a comprehensive understanding of the program, government officials repeatedly swore under oath to the court that safeguards were in place to minimize the collection and search of phone records belonging to ordinary Americans. But Walton contends that those safeguards “were never adequately designed to comply with the governing minimization procedures” ordered by the court. On Friday, the FISA Court approved a 90-day extension of the bulk call records collection program. The order came one day after the Obama administration proposed an end the government’s collection of such data. Under the proposal, customer call data normally given to the government would instead be stored by telephone companies. The companies would have to make the data available to the NSA under specific, court-approved requests.